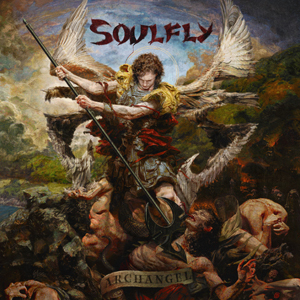 On August 14th (worldwide) metal icons SOULFLY will release their 10th studio album, Archangel, via Nuclear Blast Entertainment. Today, the band has revealed the stunning cover artwork created by artist Eliran Kantor (TESTAMENT, ICED EARTH, SODOM) for the band’s upcoming dark and atmospheric masterpiece. "I've been a fan of Max's music ever since discovering Beneath The Remains in high school. When my wife and I got married "Territory" was even played at the dance party part of our wedding. “Max asked me to do a traditional piece depicting Archangel Michael - and I tried to go beyond the straight-up neo-classical style as that has been perfected centuries ago, so I mixed in SOULFLY's own visual world: hence the wings and spear being shaped like the SOULFLY tribal icon, the cliff with the ocean view just like on the first record, and the Brazilian flag being the core of it's color scheme." Archangel was produced and mixed by Matt Hyde (SLAYER, BEHEMOTH, CHILDREN OF BODOM). Check out the track list for all formats and list of guest performers on the album below. Pre-order Archangel in a bundle or by itself in multiple formats right HERE. As previously reported, SOULFLY will embark on a monumental North American headlining tour starting September 30th in Los Angeles, CA! Joining them on this epic campaign are Swedish melodic-death metal visionaries SOILWORK, Polish technical death metallers DECAPITATED and hot newcomers SHATTERED SUN.